Getting your prints to match what you see on your monitor is one of the biggest challenges you’ll face when dealing with digital art or photography. This article explains how you can use printer- and paper-specific instructions—called profiles—to achieve more accurate results. The first step, however, is to understand the different ways in which color is produced by monitors and printers. Once you understand that, the whole “color-matching” problem starts to make a lot more sense. A monitor’s surface is made from glass (or other transparent material) and, depending on the type, produces colors with phosphors, LCD elements, or other light-emitting technology. Printers, on the other hand, use a combination of opaque paper, reflected light, and CMYK ink (short for cyan, magenta, yellow, and black). Newer printers designed for fine art prints can also use additional colors like light cyan, light magenta, several varieties of black, and so on. Given these two completely different approaches for creating color, it’s a miracle that any images on your monitor look like the ones you print. And because there are a slew of monitors and printers on the market—each using different printing technologies—your art will look different simply because of the monitor or printer you’re using at that moment. Even changing the paper in your printer makes a big difference in how designs, artwork, or photos will print. 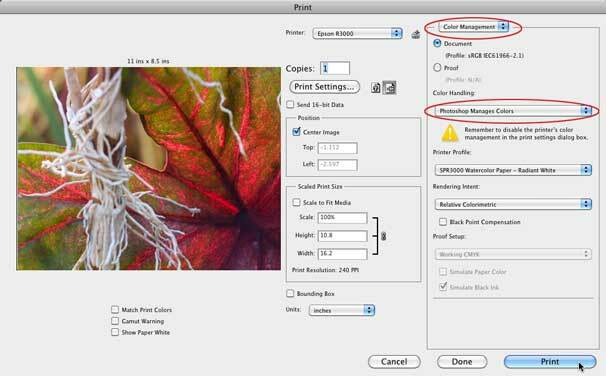 Therefore, the only way to achieve consistent printing results is to know which printer your art is headed for, which color mode that printer wants your art to be in, what range of colors that printer can reproduce on paper, and which paper you’re using. Whew! Once you get that information, you can communicate it to the program you’re printing with. This article describes how you can make that happen in programs such as iPhoto, GraphicConverter, Adobe Photoshop Elements, and Photoshop CS5. In most cases, your painting or image starts life in RGB color mode (short for red, green, and blue) and eventually ends up being converted to some version of CMYK when it’s printed (by the printer itself or manually by you in a program like GraphicConverter, Photoshop Elements, or Photoshop). How do those two color modes differ? By the range of colors they can reproduce, called a color gamut. • Colorants (color-producing substances). The printers you’re likely to encounter include inkjet and laser printers, commercial offset presses, and digital presses. Some printers, like commercial offset presses, use pigment-based inks to create color. Others, like inkjets, use dye-based inks, and still others, like laser printers and digital presses (which are like fancy laser printers), use toners. • Dot pattern. All the printers mentioned above use a pattern of dots to reproduce your images. Commercial offset presses use halftone dots that are commonly made from circles and diamonds. • Paper type. 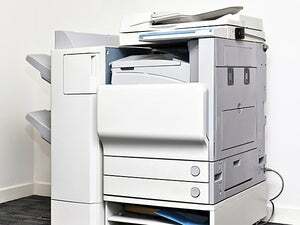 Each printer can also utilize a wide range of paper. For example, you can print on plain paper, matte, super high-quality glossy paper (which yields a much higher-quality print), and so on. If you want your inkjet printer to reproduce its full gamut of color, you need to use a specially coated paper made to work with dye-based inks. To account for all these variations, you can use profiles to tell the program you’re using exactly which colorants and papers you want to print with. Most of the time, you can download profiles right from the printer or paper manufacturer’s Website, although you might have to hunt for them. You can also do a Google search including your printer make and model, such as “Epson R3000 profiles”. The profiles you get from big companies, such as Epson, come with an installer, too. You can also search for paper-specific profiles, commonly referred to as paper or output profiles. For example, Epson makes profiles to match almost every kind of paper it sells. The more closely a profile matches your printing conditions, the more accurate and useful it is. 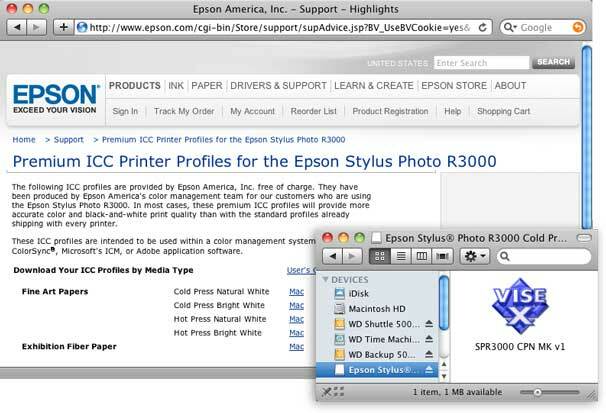 Here you can see the paper-specific profiles available for Epson’s Stylus Photo R3000. Once you’ve installed a profile, you can access it within your Mac’s Print dialog box (though you may need to restart the program to get the new profile to show up). You also need to instruct the program you’re using to manage the color itself, instead of letting the printer do it. 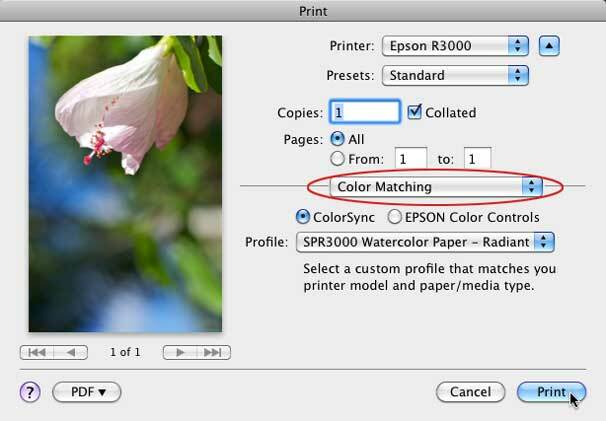 For example, to use a printer profile with iPhoto, choose the photo you want to print and then in the final print dialog box—the standard Mac OS X print dialog box, not iPhoto’s print settings dialog box—choose Color Matching from the pop-up menu in the middle and turn on ColorSync. When you do, a Profile pop-up menu appears underneath. You can access printer profiles within any program that uses a standard Mac OS X print dialog box including iPhoto, GraphicConverter, and others. The trick is to turn on ColorSync, as shown here. In Photoshop Elements, choose File -> Print and then click the More Options button at the bottom of the dialog box. In the resulting dialog box, click Color Management on the left and from the Color Handling pop-up menu, choose “Photoshop Elements Manages Colors”. This activates the Printer Profile pop-up menu, as shown here. Adobe’s products use their own print dialog boxes so accessing profiles is a little different, as shown here in Photoshop Elements. In Photoshop CS5, choose File -> Print and then from the pop-up menu at the top right of the resulting dialog box, choose Color Management. When you do, a Color Handling pop-up menu appears underneath. 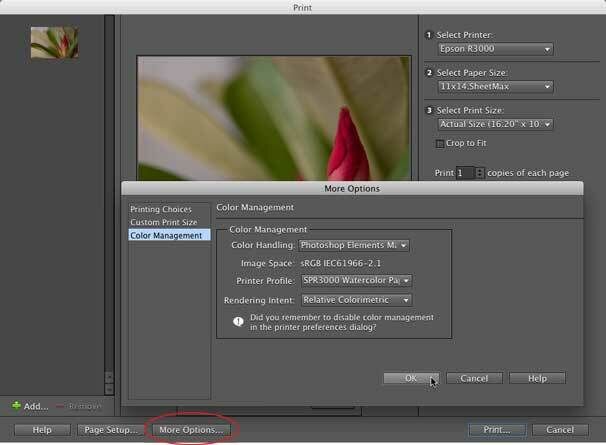 Choose Photoshop Manages Colors and then make a selection from the Printer Profile pop-up menu. Photoshop CS5’s print dialog box. As you can see, it takes a little work to locate, install, and utilize profiles, but the results are well worth it. PhotoLesa.com founder Lesa Snider is the author of Adobe Lightroom CC and Photoshop CC for Photographers Classroom in a Book, Photos for Mac and iOS: The Missing Manual, Photoshop CC: The Missing Manual, The Skinny ebook series, and over 40 video courses. She also writes the Beginner’s Workshop for Photoshop User magazine.